Trust among coaches and teachers greatly increases teachers’ willingness to make changes in their instructional habits or behaviors. Another aspect of effective coaching relationships is descriptive feedback, which helps teachers make connections between their knowledge and skills in the classroom. Providing teachers with choice in coaching relationships can motivate them to grow and personally commit to change. Coaching should be nonevaluative in nature, as productive communication can only occur in nonthreatening environments. Coaching should emphasize growth and learning. Ideally, a coach should not have management responsibilities over the coachee. Coaches can help teachers move from the Beginning (1) level to the Developing (2) level by alerting them to errors and omissions and providing specific feedback. To advance beyond the Applying (3) level to the Innovating (4) level, a teacher should create a macrostrategy. Coaches can help teachers facilitate discussions to improve school performance during coach-teacher conversations by using one of the four types of conversations. Focusing on one goal at a time is key to effective growth and sustainable performance. Teachers' progress on specific elements of teaching should be measured and tracked using a developmental scale. One of the first tasks in the coaching process is for the teacher to conduct a self-audit. This self-audit consists of four steps: (1) completing a profile, (2) selecting growth goals, (3) verifying the teacher's selections, and (4) writing growth goals. One of the ways a coach can identify errors or omissions in a teacher's use of a strategy is by examining its effect on students. Effective feedback should be timely and specific. A coach can provide feedback in several ways: informal verbal, informal written, formal verbal, and formal written. A coach and a teacher must establish a set of shared understandings and conditions that will drive the rest of their interactions. Many teachers care deeply about their profession, their courses’ subject matter, and the students they teach, which can make them feel vulnerable in coaching situations. Coaches can address this vulnerability and build trust between themselves and teachers by showing consideration for teachers’ feelings and needs as well as by acting in ways that support teachers. When teachers trust their coaches, they are more likely to consider their coaches’ advice and take steps toward self-improvement. Strong relationships between coaches and coachees can also develop organizational trust within a school and help school members understand that they can turn to one another for help and support (pp. 9–10). Arguably the most important aspect of coaching is providing feedback. Coaches can provide helpful feedback by focusing on specific behaviors that teachers can improve, limiting the amount of feedback they provide at one time, and emphasizing opportunities for growth and learning. Effective feedback also describes rather than evaluates, which means that it avoids subjective judgements of coachees’ performances and instead faithfully relays coaches’ observations. Encouraging and recognizing success are similarly important aspects of feedback that coaches can use as teachers set goals for themselves and track their progress (pp. 8–11). Coaches can provide choice in coaching relationships by encouraging teachers to use feedback, data, and their professional expertise to make informed decisions and set goals for themselves. Research indicates that allowing coachees to choose what to work on and develop strategies for self-improvement builds relationships of trust and mutual respect among coaches and coachees, which in turn strengthens coaching relationships. Additionally, eliminating choice in coaching relationships can cause coachees to feel like their experience and expertise is invalid or undervalued. An effective coaching relationship relies on the buy-in of both the coach and coachee, so it is essential that coaches indicate their respect for teachers by encouraging personal agency throughout the coaching process (p. 11). Productive communication can only occur in nonthreatening environments, or environments that facilitate an atmosphere of "equality and freedom, trust and understanding, acceptance and warmth" (Rogers & Farson, 2006, p. 281). Especially in terms of educational coaching, when these conditions are not met, often the coachee cannot feel comfortable enough to experiment with new concepts or begin dialogues about new materials or experiences. The coach should respect the coachee and truly listen to his or her experiences, thus allowing for a space where the coachee feels safe to share feelings and thoughts about particular experiences within the classroom (pp. 8–9). One way to transform a coaching environment from threatening to nonthreatening is to transition feedback based on evaluation into feedback emphasizing inquiry and learning. Research has found that coaching cultures that focus on weaknesses or "fixing" particular qualities of a coachee are ineffective. Coaches should try to focus on encouraging the positive rather than emphasizing the negative. In fact, environments that favor personal growth and learning over assessment and evaluation greatly reduce anxiety within the coaching relationship and foster a more effective and functional relationship between coach and coachee (p. 9). To ensure a nonevaluative culture in terms of coaching, educators may want to look into "off-line mentoring." Off-line mentoring is a practice in which neither the coach nor the coachee has "management responsibilities over the other. In short, the mentee will not be mentored by their boss" (Burley & Pomphrey, 2011, p. 66). When a coach has authority over the coachee, it is often difficult for the coachee to feel comfortable opening up to his or her coach about any difficulties he or she may have encountered. A coach who does not have an explicit hierarchical relationship with the coachee creates a more appropriate relationship that fosters receptivity and tolerance for both parties (p. 9). To move from a Beginning (1) level to a Developing (2) level, a teacher must correct errors and omissions in the use of a specific strategy. A coach can help a teacher move between these levels by alerting him or her of errors and omissions and giving feedback on how to correct them. The coach might identify such errors by observing the teacher, examining student responses, talking to students about the teacher’s use of the strategy, or watching a video recording of the teacher applying the strategy (pp. 61–62, 111). A macrostrategy integrates several tactics to combine summarizing, questioning, clarifying, and predicting to help students process content. The tactics used in a macrostrategy typically have research supporting their use individually and in combination. A teacher needs to reach the Applying (3) level and become fluent in several different tactics for a macrostrategy to be successful (p. 155). Reflective conversations are designed to help teachers recognize the beliefs and behaviors that affect their classroom practice. Facilitating conversations are designed to help teachers set goals. Coaching conversations are designed to move teachers closer to accomplishing their goals. Directing conversations are designed to prompt a teacher to action (p. 213). Coaches should prompt teachers to select three growth goals per school year. Ideally, each growth goal should be from a different lesson segment; one should be from routine lesson segments, one should be from content lesson segments, and one should be from on-the-spot lesson segments. Don't try to work on all three goals at the same time. If your school year is nine months long, work on one goal for the first three months, the next goal for the next three months, and the last goal for the final three months (pp. 21–28). At the Not Using (0) level, a teacher does not know about strategies or behaviors associated with an element of effective teaching. For example, a teacher at this level might not know how to help students elaborate on new information. At the Beginning (1) level, a teacher uses strategies associated with an element of effective teaching, but uses them incorrectly. For example, a teacher at this level might try to ask inferential questions, but do it incorrectly or leave out important parts of the strategy. At the Developing (2) level, a teacher uses strategies correctly, but doesn't monitor students' reactions to those strategies. At the Applying (3) level, the teacher monitors students' reactions to ensure that the strategy is having the desired effects. At the Innovating (4) level, the teacher integrates multiple strategies or adapts strategies to meet students' unique needs or situations (p. 24). Once a teacher has selected specific areas on which to focus, the coach should verify the teacher's selections. One way a coach does this is by observing the teacher during one or more sessions. A better appraisal may be obtained if the coach and teacher jointly examine a video recording of the teacher. When examining a video, the coach and the teacher should watch for specific strategies that the teacher is using correctly and effectively, strategies that the teacher is attempting to use but is executing incorrectly or with parts missing, and strategies that a teacher could have used but did not (pp. 24–29). For example, a coach may think that the teacher is correctly executing the chuck processing strategy until the coach begins to ask students to describe their predictions about new information. Upon discovering that the students cannot describe their predictions, the coach might reexamine the teacher's execution of the third part of the strategy and realize that he or she is not giving them enough time or direction to make meaningful predictions (p. 62). Informal feedback is usually brief, such as stopping by a classroom to give a quick positive comment about an observation earlier in the day. Formal feedback is more extensive and is detailed and specific about what the teacher did that was effective and what the teacher did that was not effective or needs to be adjusted. Formal written feedback might be given in a longer email or by memo. The coach normally retains a copy of formal written feedback to inform future discussions (pp. 217–218). 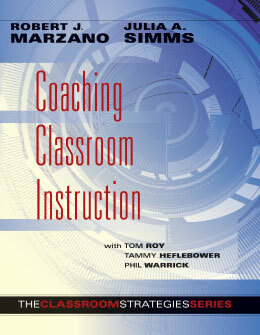 Four practices that are essential for an effective coaching relationship are: (1) establishing a model of effective teaching, (2) using a scale to measure teachers' progress, (3) conducting a self-audit, and (4) establishing a coaching perspective (p. 19). Burley, S., & Pomphrey, C. (2011). Mentoring and coaching in schools: Collaborative professional learning inquiry for teachers. New York: Routledge. Rogers, C. R., & Farson, R. E. (2006). Active listening. In J. S. Osland, M. E. Turner, D. A. Kolb, & I. M. Rubin (Eds. ), The organizational behavior reader (8th ed., pp. 279–290). Upper Saddle River, NJ: Pearson.